First off...a big THANK YOU to all of you out there who piped up with words of commiseration and encouragement after last week's vandalism...it really helped me get out of the funk I found myself in afterwards. In case it was ever in question (and it wasn't) GARDEN BLOGGERS ROCK! This weekend was a GREAT weekend. First off, the weather finally turned and we had cool (even cloudy) mornings...and sunny by cooler afternoons. I had some gardening friends over on Saturday, which was great fun (of course), and gave me an excuse to finally sweep and shovel the loose gravel off our driveway. On Sunday, I was also lucky enough to visit Joy Creek Nursery to hear a lecture by Sue Milliken & Kelly Dodson, owners of Far Reaches Farm in Port Townsend, WA. Of course, any excuse to visit my favorite nursery is welcome, right?!? Kelly (above, left) and Sue regaled us with tales of their trips to far-off lands (mostly China) in which they searched for and catalogued hundreds and thousands of plants, some of which were new discoveries. It was interesting and entertaining, as they showed us some of their favorite new introductions (one of which was an amazing Iris that I failed to get the name of...argh!). After the speech, we were welcome to peruse the plants they had brought along for sale...including the amazingly velvety-red Salvia on the left (I was tempted, but has to be over-wintered indoors, so a pass). Even though I don't need any more Crocosmias (nor do I have room for any more), I was still tempted by their display of them. My willpower prevailed, however, and I decided to venture out into the display gardens and take a look at how things were doing. It seems I seldom visit Joy Creek in the height of summer, so it was a treat seeing things so big and full. 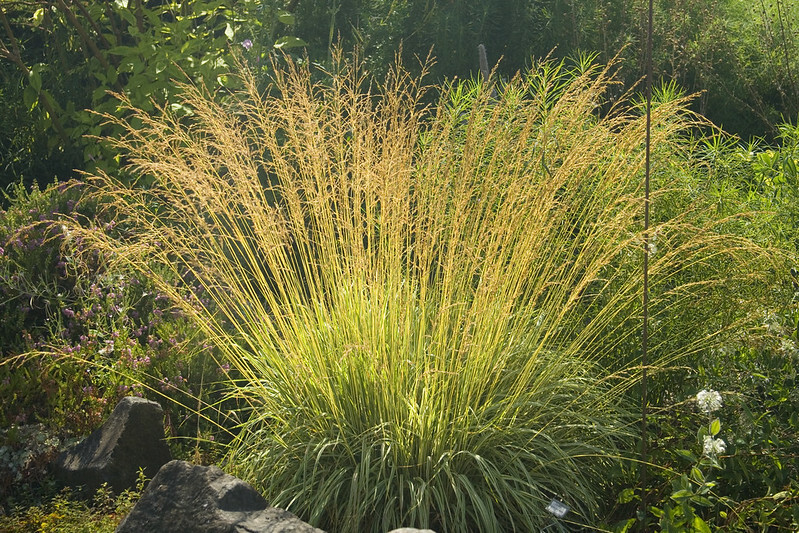 I love Panicum 'Shenandoah' (above), and hope mine looks this good someday (although mine are probably in too much shade to look this fabulous). Now that I think of it...I think I bought mine here a few years ago on Maurice's recommendation. 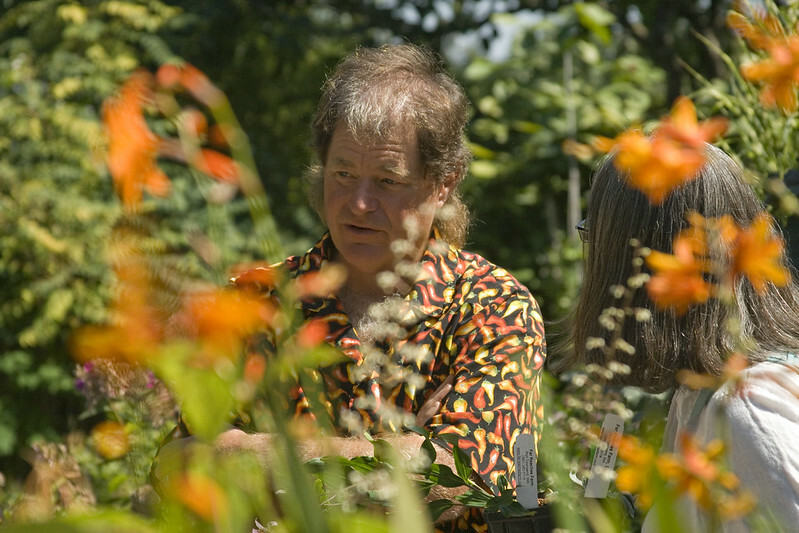 A word to the wise, if he ever recommends a plant to you...LISTEN, the man knows what he's talking about! 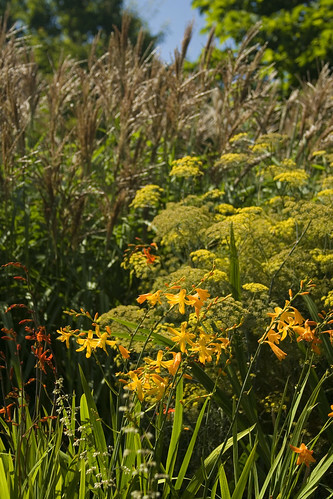 I wish I had remembered to ask what this yellow-flowered Sedum was...I loved it in contrast to the red-flowered variety next to it...must put in on my "must-have" list for next time I visit. 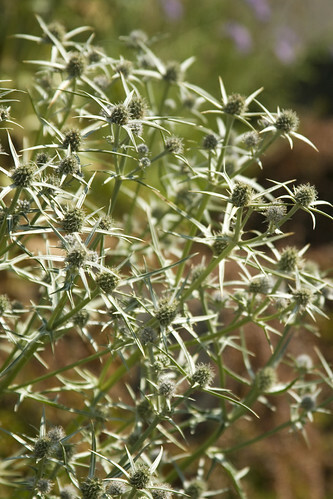 I love the blooms (spent and otherwise) of the Eryngiums...they are so very photo-friendly. I'm not entirely sure what the seed pods are on the right...but I found them fascinating as well. Right as we entered the display garden, off to the right of the driveway, we were greeted by this amazing Molinia...truly spectactular! I have to say, they've sited it perfectly, backed by the dark-leaved tree (Beech, perhaps) so you can really see that gauzy scrim of blooms and stems. I'm not entirely sure which Molinia this is, my initial thought was 'Skyracer', but it could very well be 'Transparent'. Either way, LOVE it! Yellows seemed to really dominate the garden at this time of year...but there were so many wonderful purples and pinks to be seen, as well. 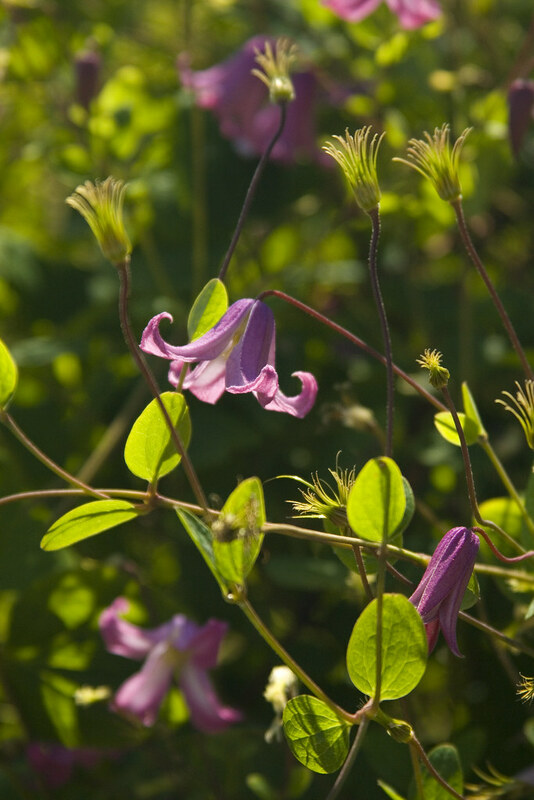 Joy Creek is well-known for their collection of Clematis (oh, to have room to grow them all). My personal faves are the smaller, urn-shaped ones, like the purple/blue one on the right ('Rooguchi', perhaps)? 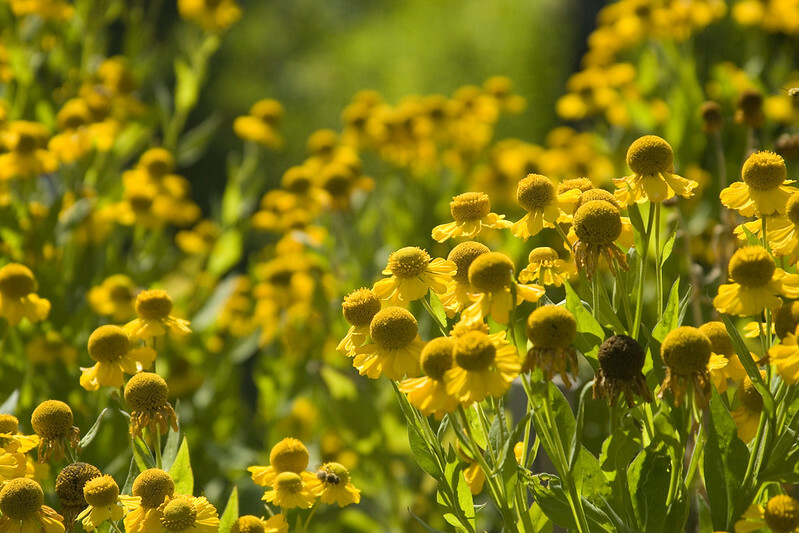 In the far reaches of the display beds was this amazing display of Helenium ('Tijuana Brass', I think). More wonderful Clematis greeted me near the Helenium above...and don't you love this perfect late-summer/early-autumn vignette of Helenium, Fennel and Miscanthus...perfection! I think (judging by the seedpods) that this is a form of Asclepias...but I'm not entirely sure! I've never seen one this exact color...and the flowers seemed different, as well. I'll have to remember to ask next time. 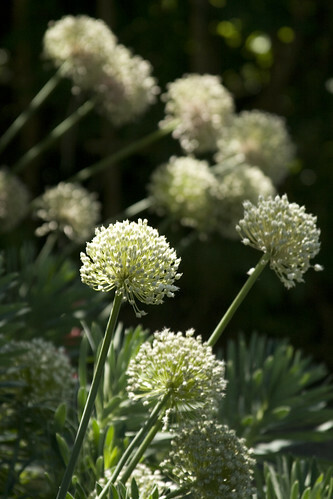 More wonderful seed-heads and spent blooms. I love the pairing of the Eryngium giganteum with Crocosmia on the left...and few things beat Alliums for the long-lasting appeal of their seedheads. Another Clematis I found in the display gardens...just stunning backlit! ...and even though I SWORE I wasn't going to buy anything...and don't even know where I'm going to put it, I got that Molinia anyway! I should have known better, I can never resist Joy Creek's plants...but I consider it extremely amazing that I didn't buy more. They have a nice crop of Schizachyrium (Little Bluestem) this year that I would love to have bought...but unless my neighbor agrees to let me plant his space...no way. 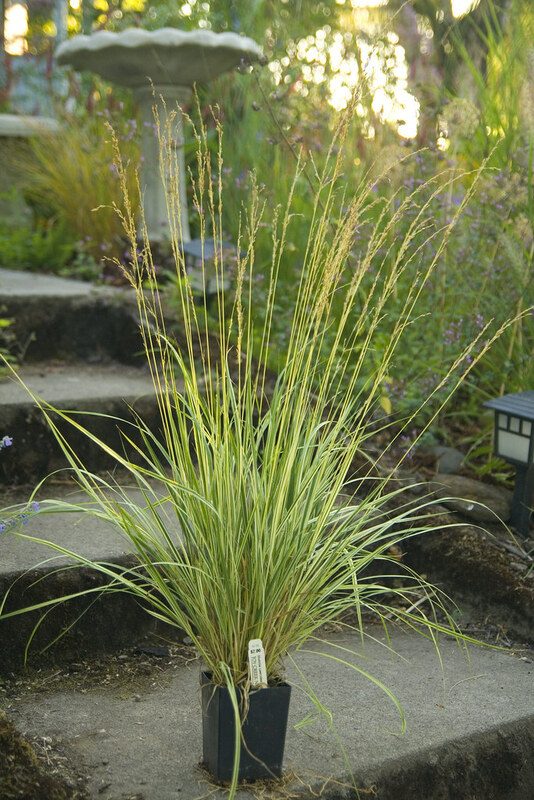 They also had a few stunning Andropogon (Big Bluestem) for sale that I REALLY wanted. However, I do have a variety of Andropogon already that struggles to stay upright due to our lack of a full-sun spot in our yard...so, sadly, it stayed behind. What a great nursery! We really don't have anything like it in my immediate area. 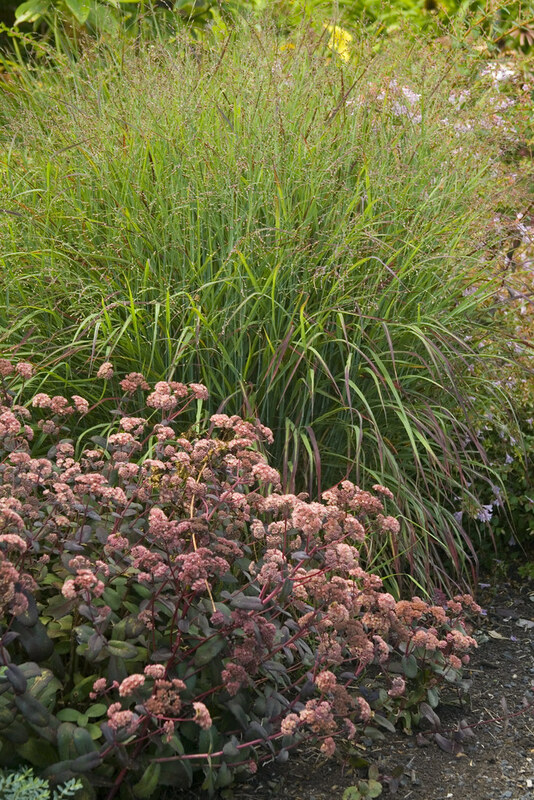 I love the mix of yellow and red sedums, and I think buying only ONE Molinia is a show of great self-restraint. 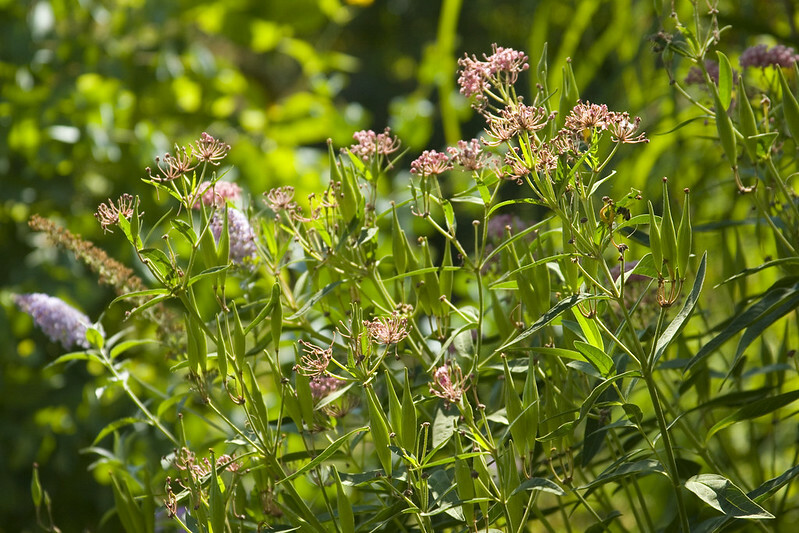 I can't be completely sure, but I think that milkweed is Asclepias incarnata - its flowers are like A. tuberosa, but red to pink. It really is a fabulous nursery...we are quite lucky here in the PNW...you can't throw a stick without hitting a good nursery :-) I agree about the Molinia...but I don't really even have room for that one, let alone more...sigh :-( I think you might be right about the Asclepias! Great Photos Scott! I have Shenendoah in the back border and it looks pretty good for the first year. I am becoming a fan of Molinia grasses because you can see through them and they can be left standing for the fall. I have a small variety called Molinia Moorhexe. I think you're going to love that Shenandoah more and more...it just gets better with age. 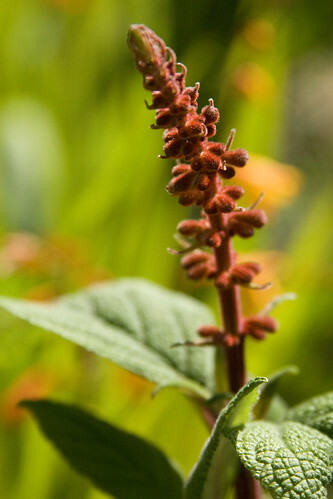 I agree about Molinias...and I have some 'Moorhexe' too! I just planted them last fall...they are still pretty small, but I love them...and isn't their fall color divine! Funny my weekend looked a lot like your weekend! (and it was pretty great). And really...are you serious? You've got tons of extra space, I saw a couple of 2" x 3" bare patches! What a great grass! And a great nursery! Sounds like the Far Reaches talk was a lot of fun, I would have loved to be there for that. Actually, I'd just like to get a look at Joy Creek, and all the other great nurseries you have down there. Oh yes...I hope someday you are able to make it out here, Alison...you'd love it! Lots of boosterism going on for Joy Creek...well deserved. Fun to see it through your eyes (and camera lens). I can never quite capture the beauty of the place. Looks like a super place to have close by. I really love my Little bluestem, such an easy plant. Isn't it wonderful...I wish I had room for a whole field of it! Hahahaha...I love that!!! I think you'll love all those grasses....I've actually ever grown them from seed...so I'll be interested to see how they fare...there is a lot of fascinating variation between seedlings, which I love! Oh you have consecutive Andrea commenting :-)). The plants you post are not necessarily nice for me especially the grasses, but that is negated by the awesome photos you never fail to show us. Maybe even the ugliest of things will be nice in your camera eye! May i know what your camera is, and your lens? thanks Scott, and thanks also for visiting my site. Hahahaha...thanks, Kalantikan! My camera is a Canon Rebel xti...one of the older models (6 or 7 years old) and the lens I used was a Canon 18-80mm (I think...I'll check that)! The Joy Creek tour was a joy...I am pretty sure that I could not resist the offerings as well as you did. There were several that I wanted as I looked at your delightful photos. I had a gorgeous planting of Little Bluestem and it just laid down on the job from lack of sun! But they are lovely grasses. Thanks for coming by. 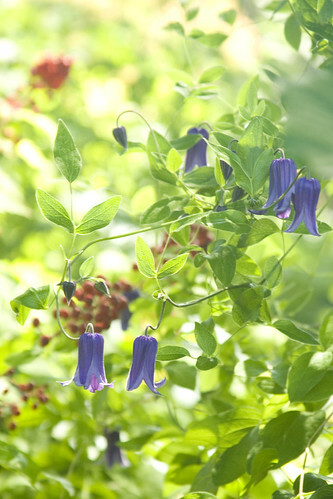 I made a pilgrimage to Joy Creek after having seen a clematis I lusted after on another bloggers website...Romantika. 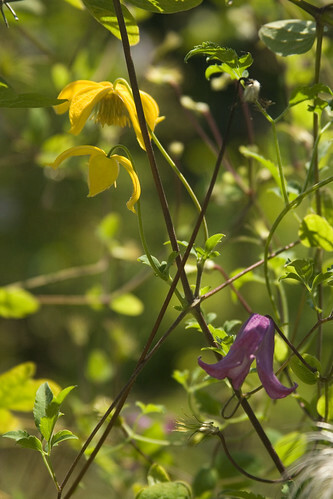 I walked away with three, Helios and Odorata, both of which have those wonderful bell shaped flowers. The vivid blue one that you showed us here is another one I may have to find out what it is. It is beautiful. Joy Creek is one of my favorite nurseries, even though it is over an hour away. Ooooo...I have to check those Clematis out...I always get kind of overwhelmed by how many there are...my head is swimming just thinking abou thtem! 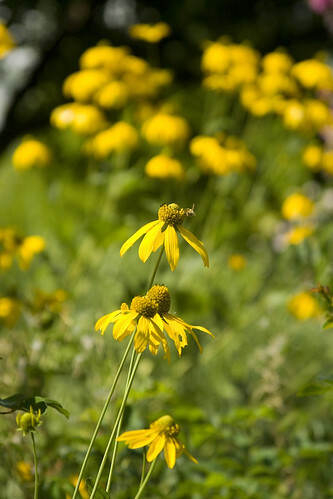 I wish I had more time to look around the gardens on Sunday ... beautiful photos. I got all my Panicum from Maurice 's recommendation , and very happy with it I am! Me too...I didn't stay nearly as long as I would have liked. It's so funny, me too...he recommended 'Shenandoah' one year...then, the next, I was looking for another and he recommended 'Northwind', now I love them both! Fantabulous photos as always, Scott! Joy Creek is such a treat and Maurice is a wonderful plantsman! I'm headed to Portland for the weekend. 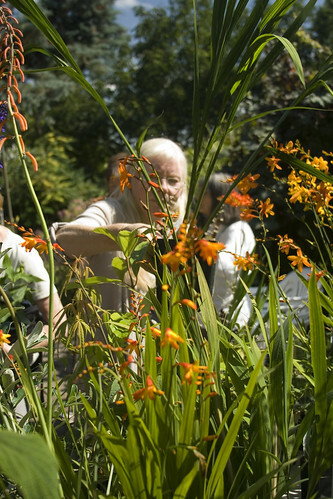 Would it be possible to see your garden? It was hilarious to read about your struggle with your impulse to purchase those tempting offerings. I feel the same way whenever I visit a nursery. OMG...it's so hard to see plants you want...but just can't have...argh! That was a fabulous tour. Your pictures are great. 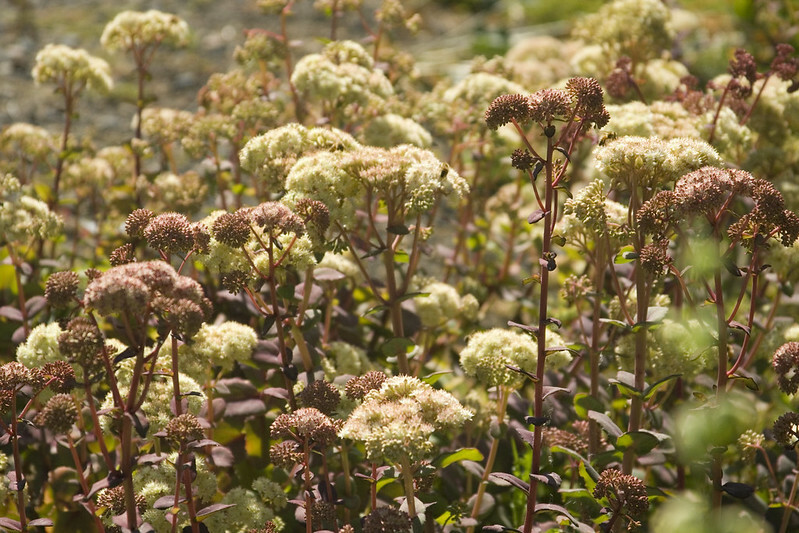 Yellow sedum, huh? I got to add that to my wish list, too. I know...I wish I had thought to ask what that Sedum was...I keep thinking about it! 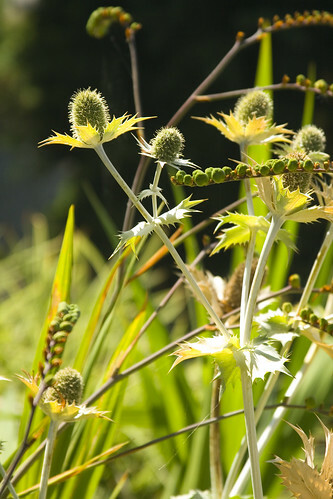 Hi Scott, I think the image to the right of the Eryngium might be Eremurus. 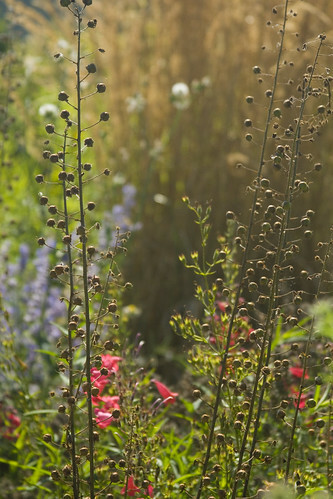 The seeds are great to leave on the stalk for that autumn ornamental effect. Ahhhh...you could be right!!! I love those seedpods, just another good reason to try planting some Eremerus again (although they seem to hate my garden). Thanks so much, Zielona...glad you enjoyed your visit! I'm in nursery-visit withdrawal right now and dying to go to a first-rate nursery again like Cistus, Far Reaches, Joy Creek and so many others near you (relatively near!). I did bump into Maurice at JC, who told me about a pale-colored Lobelia tupa seedling he found once but ultimately lost and has been on the lookout for ever since. Great guy. I don't think we can get molinia to flower like that here in zone 10 so I'll enjoy photos of them in your garden. I have never been to a garden center that I didn't buy some little something. 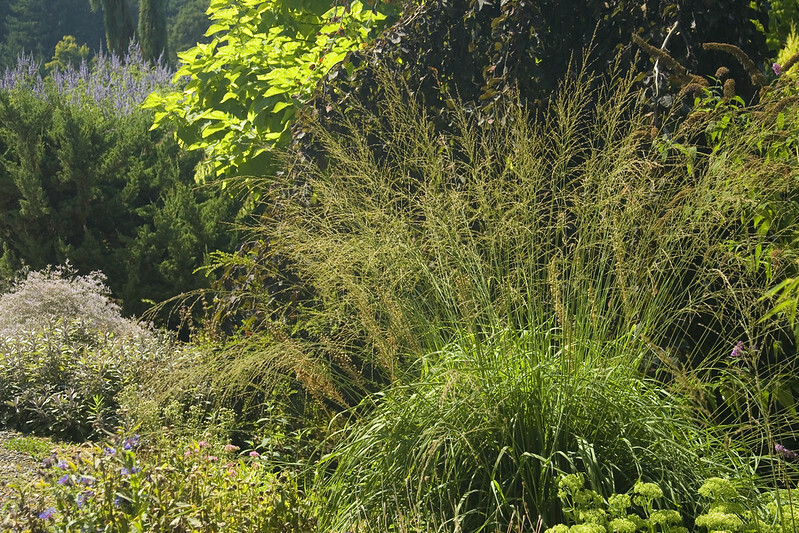 We need to add ornamental grasses to our garden. Have seen zebra grass and liked it? any experience growing this type of grass???? I've actually never had Zebra Grass myself, but I do see it around town quite a bit, it's very striking...and I think they come in a range of sizes. Joy Creek actually has one that tops out at 3', I believe. I have this Molinia and it's planted in a pot in mostly shade. It doesn't flower much at all but still looks fabulous. Thank you for taking us along to Joy Creek. One of these years I'm going to have to make it there. That's usually where I've seen it planted as well, Grace! It's true, even with only a few flowers, it's just a lovely thing :-) Yes...you MUST make it to Joy Creek someday! Hello! I've been reading your site for a while now and finally got the bravery to go ahead and give you a shout out from Dallas Tx! Just wanted to say keep up the fantastic job! It's really a nice and helpful piece of info. I am happy that you simply shared this useful info with us. Please keep us up to date like this. Thank you for sharing. write in my diary everyday. I'd like to start a blog so I can easily share my personal experience and thoughts online. Please let me know if you have any kind of ideas or tips for new aspiring bloggers. Appreciate it! both educative and entertaining, and let me tell you, you've hit the nail on the head. The issue is something that too few men and women are speaking intelligently about. I am very happy I came across this in my search for something regarding this.